Mont Blanc is unquestionably the most famous peak in the Alps. Its first ascent, in 1786, marked a turning point in the development of the Chamonix valley, which after this time was geared towards catering to the flourishing tourist market. Since its creation in 1821, the Compagnie des Guides de Chamonix (Chamonix Guides Company) has been intimately linked to Mont Blanc. 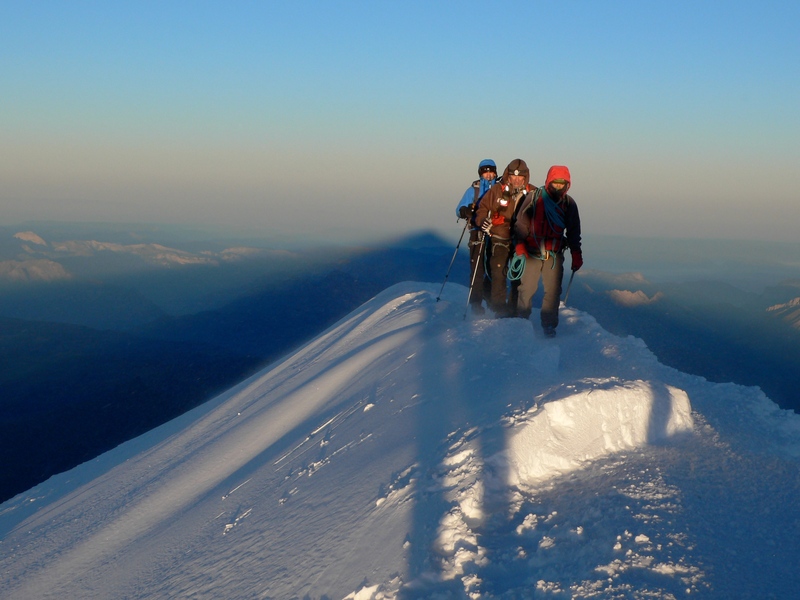 Over the years the Compagnie has developed a unique expertise for guiding mountaineers to its summit. 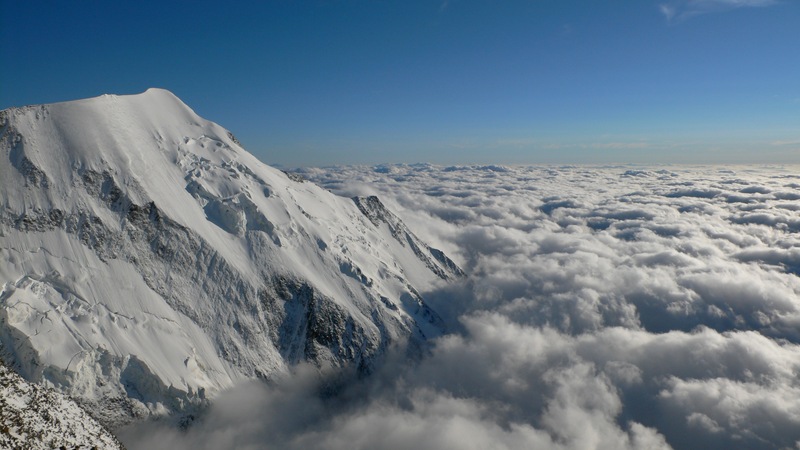 Despite its huge reputation, the ascent of Mont Blanc is a genuine challenge requiring a high level of physical fitness and technical skills in crossing rocky and icy terrain. 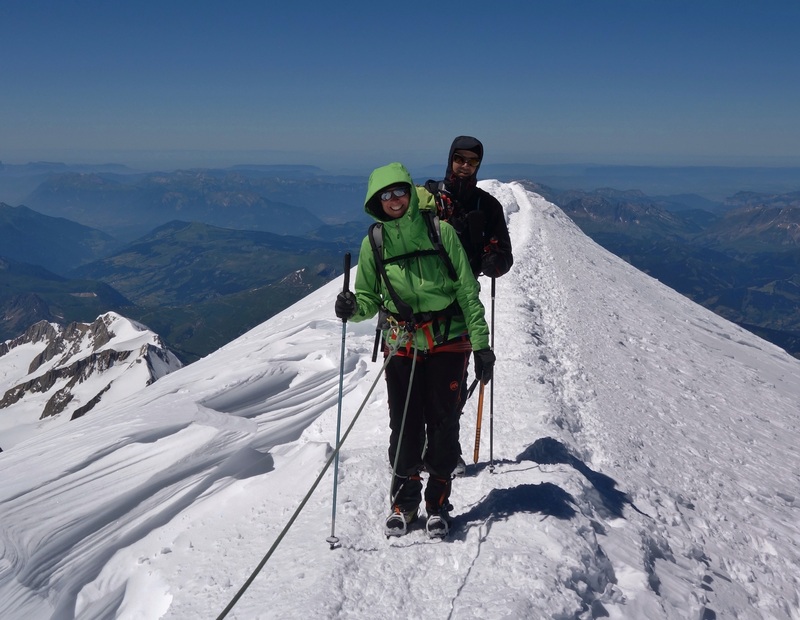 We strongly advise you not to overestimate your abilities, and we highly recommend that you take an introduction to mountaineering course (Aiguille du Tour, Gran Paradiso, etc) before embarking on this adventure. The originality of this package lies in the small group size. You progress over five days in groups of two (one guide for two clients). Personalised advice from your guide and the flexibility of this package guarantee a high-quality trip and optimise your chances of success. To avoid problems caused by participants not knowing each other, sign up is restricted to pre-existing teams of two only. For solo reservations please see our “Mont Blanc - Premium package”. Day 1 and day 2. Day routes - acclimatisation. This first two days are designed to help you settle in and get to know your guide. It also gives your body some time to adapt to physical effort at altitude. Examples of routes include: Traverse of the Aiguilles Crochues (2840m), the Petite Aiguille Verte (3512m), and the Traverse of the Pointes Lachenal (3613m). At the end of this acclimatisation period your guide will organise a debriefing. Based on your experience he or she may steer you towards a route other than Mont Blanc, if he or she judges that you are not sufficiently ready at that stage. Day 3. ‘Ecole d’escalade’ with night in Tête Rousse hut. We spend the morning at one of the valley’s rock climbing areas (école d’escalade) fine-tuning our technique on rocky terrain. We take the Bellevue cable car and Tramway du Mont Blanc to the Nid d’Aigle (2372m), from where we set off in the afternoon. A track leads us to the Tête Rousse Hut (3167m), and takes around 2½ hours. Day 4 and day 5. 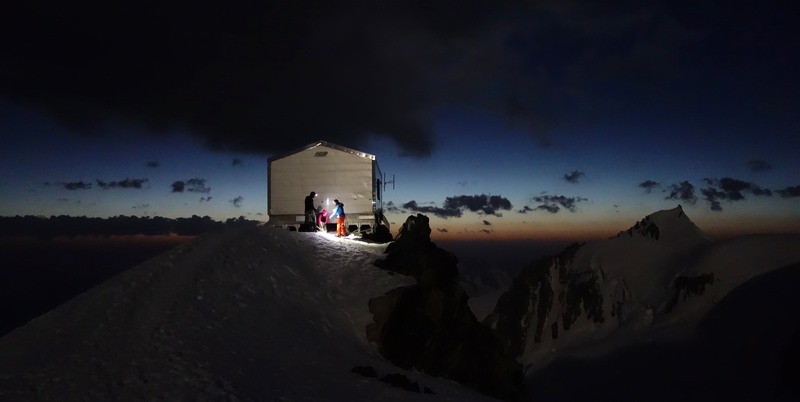 Ascent of Mont Blanc with night in Goûter hut. We leave the Tête Rousse hut in the middle of the night at around 04:00. The ascent of the Aiguille du Goûter is partially equipped with cables and leads to the Goûter hut (3835m), rebuilt in 2013. This takes around 2½ hours. We stop at the hut to lighten our packs and have something to eat. Our climb now continues via the shoulder of the Dôme du Goûter (4275m), the ‘abri’ Vallot (4362m) and the Arête des Bosses. We reach the summit in the middle of the day. From an altitude of 4808.7m (as measured in 2017) you are afforded exceptional panoramic views. It is now time to start the descent, which follows the same route. 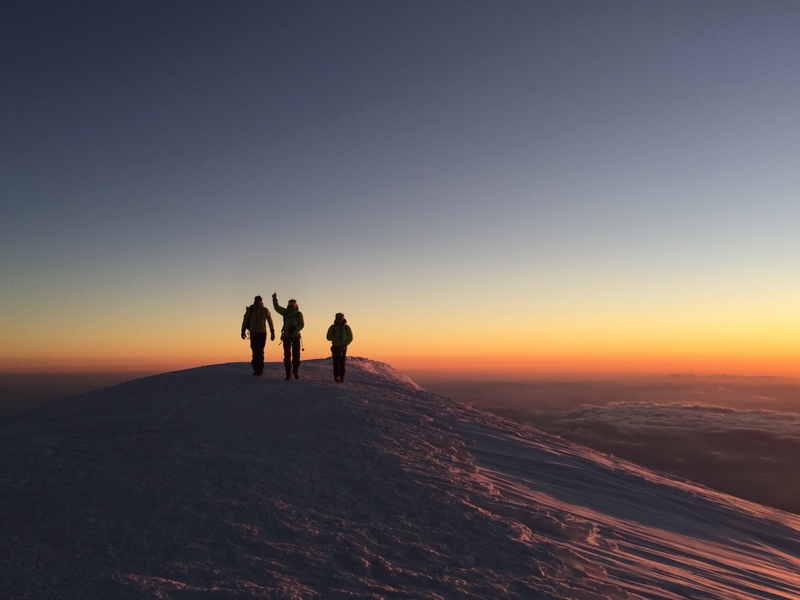 The round trip from the Goûter hut takes 6 to 7 hours. The next day we leave the hut in the early morning and continue our descent to the Nid d’Aigle, which marks the end of our trip. This takes around 3 or 4 hours of walking. 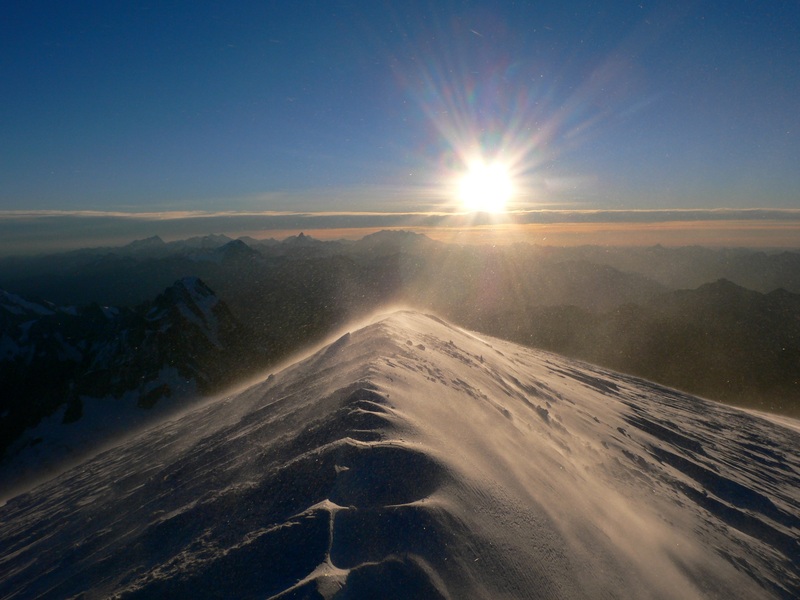 As with all climbs in the high-mountain environment, the ascent of Mont Blanc is dependent on weather conditions. The high-mountain environment is directly impacted by global warming. The rise in temperatures leads to a reduction in snow cover, which causes more frequent rock fall. 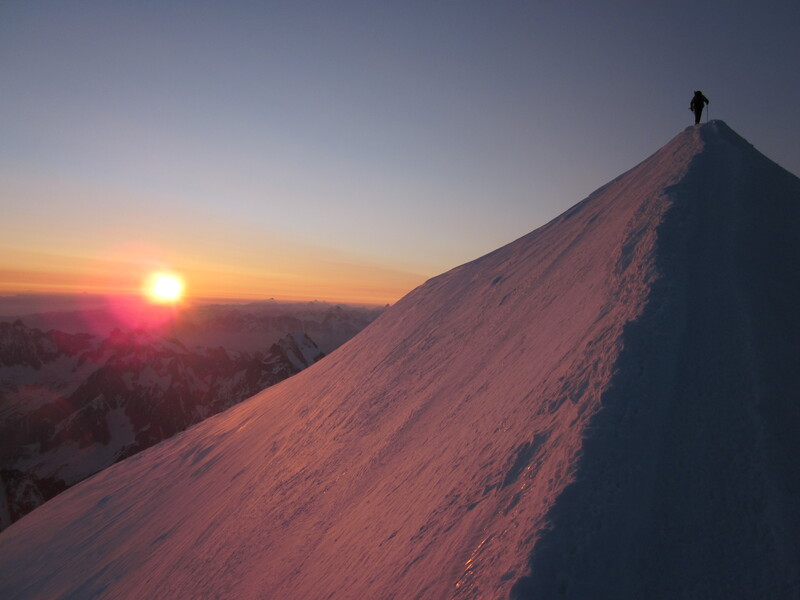 The normal route on Mont Blanc, and the climb to the Goûter hut in particular, is no exception. The mountains impose their own rules and, owing to bad weather or an unsatisfactory level of danger, the climb may not be possible. If this is the case, we will suggest an alterative objective depending on the conditions, such as the Gran Paradiso or Monte Rosa. The programme described above is a guide only and may change depending on the group’s abilities, opening times for the cable cars, weather conditions and conditions in the mountains. Refunds will not be made for changes to this programme. To avoid problems caused by participants not knowing each other, sign up is restricted to pre-existing teams of two only. For solo reservations please see our “Mont Blanc - Premium package”. MEET : Meet on the first day at 08:30 at the Compagnie des Guides office at 190 place de l’Eglise in Chamonix. GROUP : 2 people per guide for 5 days. The level of supervision, specific to the Compagnie des Guides de Chamonix, optimises your chances of success. ACCOMODATION : Two nights half-board in a hut (evening meal, breakfast and overnight accommodation). An appropriate choice of peak is essential for you to properly enjoy your holiday. To get the most out of your trip we recommend you take regular exercise throughout the year and, where necessary, undertake specific training a few months before you leave. Try to avoid last minute training that can lead to injury. Do not to overestimate your abilities, and do be aware that the weight of your pack and higher altitudes reduce your usual strength and stamina. This programme is aimed at experienced walkers who regularly take part in activities requiring stamina. Ten to 12 hours physical effort per day means you should be able to finish a half-marathon. Previous mountaineering experience is strongly recommended. ORGANISATION : Our advisor, Laurence, is available for any questions you might have. DOCUMENTATION : Participants must have mountain sports insurance with repatriation cover. We strongly recommend that this also includes cancellation cover. You can take out insurance offering both of these types of cover when you sign up. Participants must also take valid ID with them. We recommend you take particular care over you choice of equipment, as it plays a large role in the success of your trip. Weight is critical, and you must always evaluate the weight-to-comfort ratio to find the best compromise. Weather conditions can be extremely variable: from 20ºC on the approach route to the hut, to -15ºC on the summit (like a cold winter’s day in a ski resort). Generally speaking, it is better to put on several thin layers than to have one bulky item of warm clothing, and it is vital that you remain dry at all times. The final level of training to climb independently and unguided. Including one night in hut. A stay to learn glacier hiking in a majestic setting over 3000m altitude! A programme focus on security in high-mountain. One night in hut included. A package to respond to your specific needs.